For 2015 the top holiday themes all have a classic or nostalgic twist. Think Charles Dickens, Hollywood in the 1950s or even a rustic cabin from the turn of the century. My favourite theme for the holidays is 1950's retro. But honestly, trends aside, just pick a theme that you love and think will be fun for your guests. My husband and I love throwing a good party. With busy careers and a young family, we don't host social gatherings often, but when we do, we like to go all out and give our guests an experience they'll remember. The holidays are a perfect example: We've come to host an annual holiday gathering for family and friends -- it's the one time of the year where we go big. The party is always a lot of fun, but each year I'm always wondering how we can change things up and make the next event even better. As luck would have it, I recently had the chance to chat with lifestyle and décor expert Janette Ewen -- she was selecting some items from our eBay Festive Favourites Gift Guide to include in her holiday media segments. I took the opportunity to ask her for some holiday hosting tips and how to bring a party to the next level. She, of course, gave some great advice. Read on for our conversation. AS: There's so much to consider when throwing a big holiday party -- the food, the music, the décor. I really think the hardest part is just getting started. What is the first thing you should do in the planning process for a holiday event? JE: When planning a holiday party, I always start with a theme. A theme will shape the décor, cocktail menu, food, invites, gifts, music and even the scent of your home. Once you nail down your theme, the ideas will start flooding in, trust me. AS: That's a great point, and actually something I'm sure a lot of people (myself included) skip over. So for those looking for holiday theme inspiration, what are the trends for this year? JE: For 2015 the top holiday themes all have a classic or nostalgic twist. Think Charles Dickens, Hollywood in the 1950s or even a rustic cabin from the turn of the century. My favourite theme for the holidays is 1950's retro. But honestly, trends aside, just pick a theme that you love and think will be fun for your guests. If the host/hostess is into the theme, it will really shine through in the execution of the whole evening. AS: I'm sure you would agree that food is also another key element to any holiday event. This is definitely one area that I put a lot of effort into for my party. How would one play up the holiday party theme when it comes to food? JE: Food is definitely a focal point for any event -- you have to make sure it's delicious. But, to really take it to the next level, you also need to think about food presentation and dressing up the dining experience. Sticking with my current favourite holiday theme, I love buying vintage copies of 'Good Housekeeping' and pulling recipes from them, such as individual turkey casseroles baked in Le Creuset ramekins. Every year I go on eBay to find vintage pieces including tableware and glasses to add that chic holiday twist. This type of detail is something your guests will notice. AS: And what about décor? 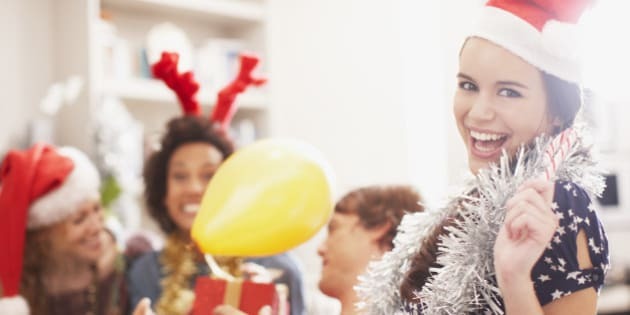 I'm sure you have endless ideas about holiday party décor, but what is your top tip for making a big impact? JE: Oh my gosh, yes, there's so much you can do with décor. But, if I could give one tip for holiday parties, it would be to focus your efforts on the Christmas tree. For example, decorate a nostalgia tree! High-design trees look great but consider having a fun second Christmas tree and gather all those ornaments you made or loved as child. It's a great conversation piece for guests, as they'll likely recognize some of the décor and reminisce. AS: You also mentioned that the theme would influence music. Music streaming services usually have some great holiday playlists broken out by themes and genres -- is that a good option? JE: Yes, that's definitely a great option. Another idea, which seems to always get a great reaction from guests, is to break out those old holiday records! Pick up an old-school record player online and invite guests to bring their favourite holiday albums. Some of my beloved holiday classics include A Charlie Brown Christmas and Elvis' Christmas album. AS: Wow, I love that idea! OK, final question. What is that one added detail that really takes a holiday event to the next level? How can you create that "wow" factor that will leave your guests already looking forward to next year's event? JE: Always send your guest home with a thank you gift that comes from the heart. I love giving my guests a box or tin of my favourite candy. My guests always smile when they receive them, as the box is full of happy holiday memories.